RUSH: Anybody out there who knows Howard Fineman of Newsweek, Howard wrote a column today about how he was in the hospital down in Argentina and he’s now learned what’s wrong with American health care. He knows how to fix it. Somebody call Howard Fineman and have him tune in here at 12:33, a little bit less than a half hour from now and I’m going to explain it to him. RUSH: Well, Howard Fineman just called said he can’t listen at 12:33, he’s headed up to Capitol Hill, but he’ll catch the show later. We asked him, ‘Well, you want us to delay for when you have some free time?’ He said, ‘No, no, no, no, you go ahead and do it at 12:33 and I’ll catch it later.’ I don’t miss your show at all.’ Which… That’s stunning, busy as Howard Fineman is. RUSH: Howard Fineman. This is what I wanted to say, and I really didn’t have the guts to say it. When he told Kit that he ‘listens every day’ I found it hard to believe, because none of it’s sinking in. None of it’s sinking in. If he listens every day, he has got one of the biggest immune systems that I have ever seen. I’m surprised he got sick down in Argentina. He got food poisoning down there. This guy is so immune to the truth — as espoused by me, your host — that I’m surprised he got sick. RUSH: All right, Howard Fineman writing on Newsweek’s website: ‘What the Debate Should Be About — I got sick in South America, and I realized what the health-care debate in this country should be about: costs. After covering the health-care debate for a year, I suppose I needed to clear my head and get some perspective on the medical world. But the way I accidentally did so was a little extreme, dramatic, and painful. On a trip to visit our daughter in Argentina, I got a severe case of food poisoning, and spent two nights and three days in a small, private hospital in the breathtakingly beautiful (not that I cared!) Andes resort town of Bariloche. ‘Before I say more, here’s the bottom line: I got great care at a tiny fraction of what the cost would have been in the US — even correcting for cost-of-living and currency values. My hospitalization included continuous intravenous fluids (to counter dehydration); IV antibiotics; an EKG, two blood tests and a chest X-ray; special meals; a private room; and even satellite-TV access to what seemed to be every obscure soccer match on the planet. The doctors, nurses, aides, and others were all uniformly excellent. Total cost: about $1,500. In the US, according to my survey of DC doctors (my own and others’), the equivalent care would have cost $10,000 to $15,000. That’s probably not counting satellite TV. The stark arithmetic, in turn, reminds me of what the debate here should be about but often isn’t: how to control our immense and metastasizing medical-industrial complex, which is waging the equivalent of a costly Cold War against an Evil Empire of bad food, bad habits, and greed. President Obama proclaims his plan (whatever it finally is) to be ‘reform.” By the way, he’s going to include four Republican ideas in his plan tomorrow. I don’t know what they are. I’ll find out and tell you in a minute. ‘But from what I can see,’ Mr. Fineman writes, ‘it would merely feed, at taxpayer expense, 30 million currently ‘uncovered’ people into a wasteful system that doesn’t have either the price-signaling power of a marketplace or the sweeping overview and control of a state-run bureaucracy.’ He’s ripping Obama’s plan there. ‘Either alternative might work; the latter surely does, at least in a highly centralized, communitarian country such as France. But what we have, and will have even if the president has his way, is a simmering mess of neither-here-nor-there. Most Americans have no idea how much their health care really costs, nor do they know how well it really works, compared with, say other places, practices or countries. And there is no truly national administration of a sector of the economy that accounts for about $2.5 trillion in annual economic activity — an amount of cash roughly equivalent to the entire economies of the UK and Russia combined.’ That’s what our health care spending is. ‘Now, Argentina is no role model. Their system is as much of a mash-up as ours. They spent a lot of money, proportionally (about 11 percent of GDP compared with 17 percent for us). We’re 34th in the world in life expectancy; they are 45th, according to the CIA World Fact Book. Most Argentines rely on a rickety public system; about a quarter get coverage through their place of work — which, in the leftist Peronist tradition, means through their union. Others — mostly the better off — rely on private, for-profit hospitals of all sizes and shapes. I ended up in one of the latter,’ a small for-profit private hospital. ‘I had passed out from dehydration on the way to the airport, but when my wife and daughter took me to the hospital I was aware enough to be a little worried about the place I was now entrusting with my life. There was a gravel and dirt parking lot. The entrance to the emergency room looked like the side entrance to a warehouse. The waiting room had a few chairs in a tight row. I had no choice but to intimately examine the purple foot of an injured hiker sitting in the seat next to me. ‘The equipment was not fancy and not state of the art. On the other hand, my illness was not fancy, and I am not state of the art. What they had was more than enough for me. The key is that the doctors were clearly well trained and knowledgeable, and inspired confidence with their touch of Argentine cockiness. American doctors have high regard for the education of most of their Argentine colleagues. (They only problem: they spoke almost no English. Luckily our daughter speaks like a native Argentine and she served as translator for my wife and me.) There was no waste in their rounds or in their supply rooms, it seemed to me. They treated me appropriately but not with flourish. An example. To take a shower, I needed to have my IV connection covered to protect it against water. The orderly improvised a solution. He took a clean rubber glove and cut it off at the fingers and palm to make a protective sleeve. That might not be a ‘best practice’ in the US, but it worked. In Argentina, perhaps they can’t always afford the latest in technology, but they also strike me as doctors who don’t dwell on technology for its own sake, or for the sake of impressing patients. I read the whole piece, but basically what Mr. Fineman is asking, ‘How come it costs so damn much here? I got 1,500 bucks down there for what would be 10 to $15,000 here. Where does that extra money go?’ I don’t mean to be insulting, but Mr. Fineman is an educated man. He is as informed as anybody would know, it’s been his life. But there seems to be, with certain people in certain professions that have certain worldviews, a genuine lack of knowledge about basic economics 101. Where does the money go? Howard, here’s the first thing. Who paid down there for you? Did you pay for it or did the Argentine government pay for it? I’m asking, I don’t know. He said it cost him $1,500. I’m assuming he paid for it, but I really don’t like making that assumption. I’d venture to say that the absolute primary reason there is no relationship to cost and service in this country is because the people paying for the service aren’t paying for it. If you have an insurance plan or if you are on Medicare or Medicaid, you don’t care what it costs because as far as you’re concerned somebody else is paying for it. So the real simple thing, until we get back to a direct participation by the patient customer in the cost of the service, we’re never going to get costs down. 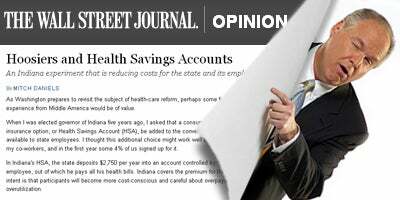 Howard, I would suggest you go to the Wall Street Journal yesterday and read a piece written by the governor of Indiana, Mitch Daniels, who reported declining health care costs in the state of Indiana precisely because the health service accounts, the HSAs, health savings accounts, are working brilliantly. They are putting people in charge of their own health care, and they are shopping for it just as they shop for a car, just as they shop for a hotel room. Some people want to stay in a Motel 6, others want to stay in a Comfort Inn, others want to stay in a bed and breakfast, but somehow in this country everybody thinks they have a right to stay at the Waldorf Astoria on somebody else’s dime. Now, if you have access to a service that you don’t think you’re paying for, then you’re not going to care what it costs, and if you have a bunch of politicians pounding into your head every day that you are entitled to that, then by God you’re going to expect it. And a politician is going to come along and say, ‘You want it? You got it, vote for me.’ It’s really simple. There’s no relationship between the cost of this service and anybody’s ability to pay for it. How do you think a Band-Aid ends up costing $50 in a hospital? There’s no logical market explanation for that. It is forces that are altering the natural ebb and flow of the market that are causing this to happen. And, Howard, there’s a second thing. I know you know this. I wish you woulda asked those doctors down in Argentina just what their malpractice insurance premiums are and how much they have to charge patients in order to stay in business just to pay their malpractice. Find out what the status of trial lawyers is in Argentina and ask if they’re getting rich by trying to put doctors out of business, by ambulance chasing a bunch of clients who have no business suing anybody except for a big power grab for money. The things that are wrong with the US health care system have nothing to do with our health care. They have nothing to do with the actual care. They have to do with who’s running it. The same people who blew up Social Security; the same people who failed at the war on poverty; the same people who failed creating the Great Society; the same people that have created this rampant entitlement mentality among way too many of our people now want to control all of health care. I would simply ask anybody, go examine one massive federal program that costs less than what they thought it was going to cost, that is efficient, that has the people who interact with that program satisfied and happy with it, or are they always complaining about it? I don’t care if it’s Social Security, I don’t care if it’s the DMV, I don’t care if it’s Fish and Game or Fish and Wildlife, I don’t care who it is, there’s nobody that is happy interacting with a government bureaucracy. The next thing we need to do, Howard, ask ourselves why a guy whose only experience with medicine is as a patient is qualified to design the entire nation’s health care system, a guy with basically no career in the private sector, a guy with basically no existence with having to make a payroll or understanding costs, a guy whose career is basically six to seven minutes old now from community organizing –well, I take that back. He did work somewhere in a law firm in the private sector where he said he felt like he was in enemy territory. 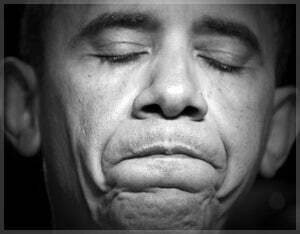 And then he goes to community organizing and does his Saul Alinsky bit. Then he runs for the Illinois Senate, look at the state their budget’s in. Then he comes to the US Senate. He voted for every spending bill that Bush proposed and he’s blaming everything he inherited on Bush, when he voted for every dime of it and wanted even more. But why is it, Howard, that we’ve got 530 Republicans and Democrats exempting the doctors who are out there in Congress? Where is it written that these clowns are in charge of putting together a health care system when they are the ones who broke it? Howard, I’ll tell you, I had a little medical scare myself out in Hawaii in December. And not to belabor the point, but it involved an ambulance ride with EMS guys, getting EKGs all the way, it involved a chest X-ray, it involved two overnights, a bunch of testings, IVs, I got an angiogram. It cost 60% less than had I used my insurance, which I don’t have, Howard. I self-insure because it’s cheaper. I get grief when I tell people I pay for my own health care, somehow that makes me out of touch. ‘Well, easy for you to do. You’re bragging, we all can’t do that. Imagine making 50 grand.’ I understand. This is the vicious little cycle. You ought to be able to afford basic office checkups at 50 to $75,000 a year without having to use an insurance policy for it, and you could if Uncle Sam were not part of the mix and if the state governments were not part of the mix, all these stupid mandates on the insurance companies. Howard, this is a government problem, pure and simple, just as every other screwed-up program in this country servicing the entitled is a disaster. And the people who bring us these programs now want to control what you properly pointed out was two and a half trillion dollars of our economy. And there’s not one of them, other than the doctors that are elected to office that has the slightest competence, qualification. Just because they care doesn’t mean they’re qualified. Would you let Obama perform the medical procedures on you when you were in Argentina? Would you have Obama call those doctors, ‘Here’s how you need to do this’? Would you? The last thing I thought about was calling anybody in government when I had to go to the hospital. All I wanted to do was have a relationship with the doctors and let them know they were going to get paid. And that wouldn’t have even mattered, because I got emergency type treatment. But paying for it myself cost a whole lot less. Now, where do these medicines and medical devices come from? How many patients and patents, I should say, has Argentina received? How much do they spend on research and development? You gotta understand how things end up being the best. You said Argentina is not the best, we’re best. How did that happen? It’s not because government mandated it or because somebody up there knows the best. The free market worked around these people and the obstacles that they represent to become the best. RUSH: There’s so much that so many smart people just don’t understand. It never occurs to them. Like, for example, how many big drug companies are there in Argentina that had to spend a whole lot of R&amp;D and development costs and so forth for the drugs that Howard Fineman was given while he was there? How many patents do they have? I don’t know but I’m just telling you what the best costs, if that’s what you want. And when you think it doesn’t cost you anything, that somebody else is going to pay for it and a politician agrees with you, we’re sunk. People I think have to have a fundamental understanding of just how things come to be. How does the United States come to be the best in health care? It’s not because of our government. It’s because of freedom — and Obamacare is all about restricting freedom, pure and simple. Howard, by the time Obama finishes there’s only going to be one option: Government insurance. That’s it. There’s not going to have any competition. That’s his aim, that’s his objective. Because, Howard, when these guys control health care, they control every aspect of our lives and can legislate based on costs to the government, decides who lives and dies who gets treatment who doesn’t, what you eat what you don’t eat. ‘You know, the life expectancy is going up, but you can’t eat at McDonald’s anymore if you want government health care,’ and that’s going to be the only health care there is, and we have guys like Obama in office who very much want to do that. Now, we got $2.5 trillion dollars of our economy that is health care, as Mr. Fineman points out. And the guy who says he’s got all the answers to fix the US health care system is spending $1.5 trillion a year in deficits, money we don’t have! What are we getting for that? Somebody explain to me when it happened that politicians became the experts on high-tech, health care, energy, and the like. When did they become the experts on manufacturing automobiles? Who are they to bring people up and basically try to ruin their careers simply because they don’t hire union workers to make their cars? We are lost in this country because we have made government figures godlike. We have assumed that they and only they have the answers, when they have zero qualifications to manage the outside-of-government things they want to manage. Zero qualifications. There’s not one business who would hire Obama to do anything for them. Not one. Now, this is the same thing with public school vouchers. But in an HSA, they put the money in that they would otherwise be spending on your health care, and it’s up to you. You go shop it, and whatever you don’t spend at the end of every year is yours, your permanent property. ‘For the very small number of employees (about 6% last year) who use their entire account balance, the state shares further health costs up to an out-of-pocket maximum of $8,000, after which the employee is completely protected. The HSA option has proven highly popular. This year, over 70% of our 30,000 Indiana state workers chose it, by far the highest in public-sector America. Due to the rejection of these plans by government unions, the average use of HSAs in the public sector across the country is just 2%. ‘HSA customers seem highly satisfied; only 3% have opted to switch back to the PPO. The state is saving, too. In a time of severe budgetary stress, Indiana will save at least $20 million in 2010 because of our high HSA enrollment. … Most important, we are seeing significant changes in behavior, and consequently lower total costs. In 2009, for example, state workers with the HSA visited emergency rooms and physicians 67% less frequently than co-workers with traditional health care.’ Why? Well, because it’s their own money and what they don’t spend on health care they could buy a plasma or whatever the hell they need, a new Toyota muffler or whatever. ‘They were much more likely to use generic drugs than those enrolled in the conventional plan, resulting in an average lower cost per prescription of $18. They were admitted to hospitals less than half as frequently as their colleagues. Differences in health status between the groups account for part of this disparity, but consumer decision-making is, we’ve found, also a major factor. ‘By contrast, the prevalent model of health plans in this country in effect signals individuals they can buy health care on someone else’s credit card. Americans can make sound, thrifty decisions about their own health. If national policy trusted and encouraged them to do so, our skyrocketing health-care costs would decelerate.’ And this is common economic sense. This has come out of the Heritage Foundation, it’s come out of any number of places, and it is routinely pooh-poohed by unions and government people who do not want costs to go down, who do not want you in control or in charge of your health care. More liberty for you equals less power for them. It’s that simple.